The commonplace heresy of our time has been for some time that Jesus is not true God. He was a good teacher but not very God of very God. Today’s Gospel reading, as does all the witness of the Scripture speaks for and out of His Divinity. There has been another heresy call docetism that Jesus just appeared as a man, but was God alone in the appearance of a man: a phantasm, an avatar of the celestial plane. This heresy said that the body and all matter was crude and debased and only the pure spirit was real. As in Yoda pinching Luke Skywalker and talking about “this crude matter”. Jesus’ sufferings were only an appearance as well. Suffering is not a phantasm in our lives, neither were Jesus’. This would also mean that joy is only an appearance, but it is not and neither is the Lord’s joy in finding lost! These are as the Apostle Peter wrote, “cleverly devised myths”. Either way we do not have the Savior who touched the disciples in their fear to calm them body and soul but He did. He touched the blind, the lame, the deaf, the mute, the dead to see, walk, hear, speak and live. Either way heresy leads us away from Christ. Either heresy denies the Atonement If Jesus was not true Man then He did not lead Peter, James and John up the Mountain and if He was not true God, then He could not have been transfigured before Peter, James and John. Either heresy, divides the two natures, man and God. The Bible is clear: Jesus is not divided, nor the persons confused, but He is the one Christ for us and for our salvation Who came down from heaven. His transfiguration shows clearly, as clear as the light that shone forth from His Face that He is God and He touches His disciples to show He is Man. He is not 50% man and 50% God, but 100% God/100% man. He still is as He sits at the right hand of the Father. As recorded in the Gospels, the Father clearly said twice: This is My Beloved Son, with Whom I am well pleased. The Father said this when His Son was baptized by John as we hear at the beginning of the Epiphany season. The Father says the same on the Mount of Transfiguration and He added: Listen to Him. As the Mother of God said to the servants at the Cana wedding feast, do what He tells you. The Holy Spirit teaches us what Christ has said and who Christ is. We are trained in the righteousness that comes by faith in Jesus Christ, not by the Law. The Law can not transfigure us. Christ came to do what the Law can not do: transfigure us. “Transformed” is the same root as “transfigured”, a metamorphosis. Our minds are renewed and transformed in Christ: for instance, we learn that life is not politics, life is Christ. Everything we have and own is not everything, as God alone gives every thing. Life is more than food, clothes and drink. We learn that sin is the great burden but virtue is not. We know there is right and wrong. We have learned we are not self-invented, but wonderfully and fearfully created. We are not a random accident. We learn the Father’s forgiveness in Christ once and for all. Peter wanted to stay there on the mount of Transfiguration. A woman asked in the Bible class as the Mayflower where is the mount of Transfiguration? I said it is unknown as to location. As it should be. Peter wanted to build three tents or tabernacles, equal for Jesus, Moses and Elijah. They are not equal and Moses and Elijah know that! If Jesus had agreed to Peter’s offer that mountain would have been the Mecca of all Meccas…and Jesus would not have touched Peter, James and John so they could see Jesus only, Jesus only going the lonely way through the valley of the shadow of death to another mountain, a hill actually, called Skull. We could not have been redeemed, forgiven and sealed with the Holy Spirit to be His own in His death and resurrection. In Jesus, we do not see tolerance, but we see love. If Jesus would have gone the way of tolerance, He would ‘not’ have gone to the cross but would have left us in our sins. And if we were left in our sins, we would be left with damnation. So much for the way of tolerance! But because of His great love for us and His rich mercy, Jesus could not tolerate our sin. Indeed, the Son of God could not tolerate our sin, so He was compelled to the cross – in love – to do something about it. They are blots and blemishes, reveling in their deceptions, while they feast with you. 14 They have eyes full of adultery, insatiable for sin. They entice unsteady souls. They have hearts trained in greed. Accursed children! 15 Forsaking the right way, they have gone astray. This is God’s Word, even the Gospel; that we are ransomed by Christ from death, sin, and hell: Whoever hears that, has this light and has kindled this lamp in his heart, even that by which we may see the One that enlightens us, and teaches us whatever we need to know. But where this is not, there we rush on, and by principles and works of our own device would find out the way to heaven. Of this you can judge and see by your light, that it is darkness. Therefore since they have not the light, neither wish to receive it, they must remain in darkness and blindness. For that light teaches us all we ought to know and all that is necessary to salvation, a thing which the world by its wisdom and reason knows not. And this light we must still have and depend upon, even to the day of judgment. 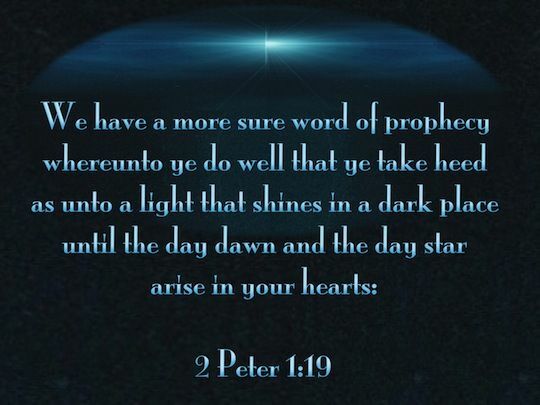 Then shall we have no more need of the Word, just as we put out the lamp when the day breaks. Jesus told His disciples not to speak of the Transfiguration unto the Son of man is raised from the dead. His resurrection is beyond any epiphany. In the Name of the Father and of the Son and of the Holy Spirit.